By far, the most common request for pest control is for roach infestation. In addition to being unsightly, roaches carry diseases, bacteria and allergens. They leave droppings and shed skin that can contaminate not only our living environment, but also our food. Cockroaches reproduce rapidly, which means that a pest control specialist should be brought in immediately, to avoid further infestation. In severe infestations, roaches can be seen (even during the day), can produce a distinct, oily, musky odor, and make noticeable sounds. They are especially hazardous to small children, who may crawl along the floor where roach droppings exist. How do roaches get inside our homes? Roaches may enter from neighboring buildings through open doors, windows, vents, and crawlspaces. They may hitch a ride in on something you brought into your home. They frequently colonize in sewers, and may enter homes via sewer pipes. They may also travel between homes via electrical lines. Once inside our homes, they can establish a colony in hard to reach places, such as inside walls and vents, behind drop ceiling, under large appliances, and behind cabinets. Roaches prefer dark, damp places to live and breed. 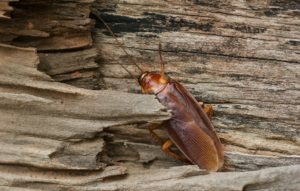 Since roaches prefer darkness, if you see roaches during the day, it could mean that either the infestation is so severe that they are forced out of crowded colonies, or that food is scarce, causing them to seek out food. Some species of roaches have been known to bite humans, however it is rare. The American, Oriental and Brown-Banded cockroaches lay approximately 16 eggs in one case, and females can lay around 2 cases (32 eggs) per week. German roaches, by far the fastest reproducers, can lay 50 eggs, twice per week. This means that one American Cockroach female can produce around 1600 eggs per year, and each German Cockroach female can produce around 50,000 eggs per year. We believe in an Integrated Pest Management approach with regard to all our pest control services. We not only locate and treat the pest infestation, we help make sure they don’t return in the future. For more information, visit our main Accurate Termite & Pest Control website.